It’s a double edged sword as they say, because the missing man, Grant Broster, has been reportedly located, unfortunately drowned in the River Wey incident in Guildford. He has been missing since Easter Monday after an incident involving his upturned kayak. Our two handlers Dave Marsh and Mike Dermody, with their specialist Water Search Dogs [Sasha and Quincy] were called out by Surrey Search and Rescue to assist them with search operation. weir/sluice gates adjacent to The Row Barge public house. 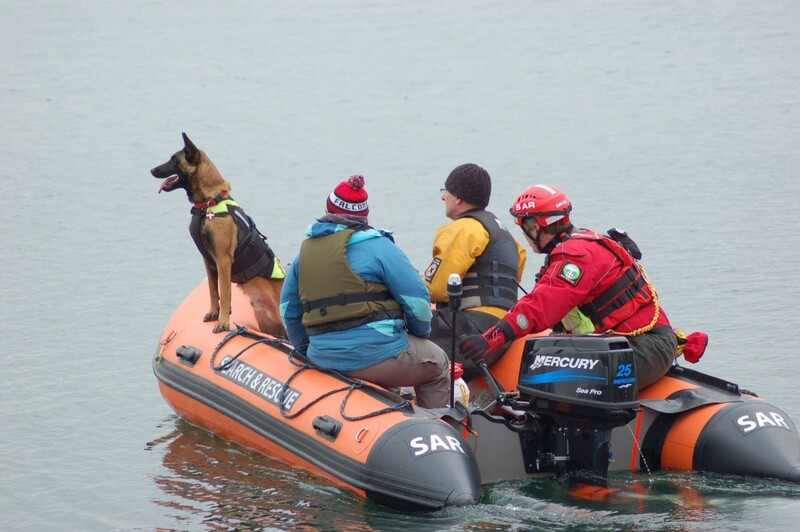 Working upstream, Sasha gave a positive indication in one area which was checked by Mike and Quincy at a later time in the search with the same positive indication coming from Quincy. Both dogs got 3 more positive indications at the same point over the morning period. Ably assisted by the boat crews from Surrey SAR, the river surface was searched along its length back to the place last seen as a matter of course. Once back at the r.v point, a debriefing session took place. It can now be reported that where the body of Mr. Broster was found, was indeed the point of interest shown by the two specialist water search dogs during the course of their searching. This can now be recorded as a positive find and is the first time a Water Search Dog has been successfully used in England, which has been trained by a voluntary organisation.